Anderson, Kevin J., and Doug Beason. The Trinity Paradox . Bantam/Spectra 1991. What if: US nuclear weapons research was slowed down, while the Nazis accelerated theirs. Summary: An accident propels an anti-nuclear activist back to 1943 Los Alamos and she sets out to prevent the Trinity test. 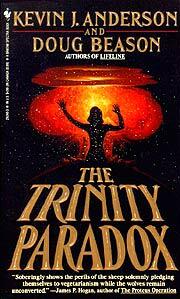 Summary: On the writing of The Trinity Paradox . Published: In Midnight Zoo #5 (1991) (ed. Jon L. Herron), Experiences Unlimited 1991.